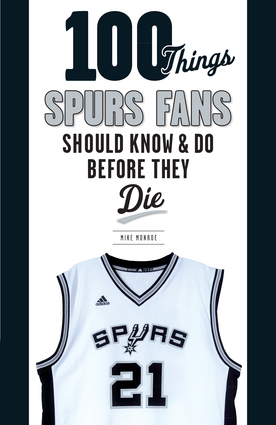 100 Things Spurs Fans Should Know & Do Before They Die is the ultimate resource guide for true fans of San Antonio basketball. Whether you're a die-hard fan from the days of George Gervin or a new supporter of Kawhi Leonard and LaMarcus Aldridge, this book contains everything Spurs fans should know, see, and do in their lifetime. Mike Monroe has covered pro basketball for more than five decades, including 12 seasons as the Spurs beat writer for the San Antonio Express News from 2004 to 2015. In 2014, Monroe was named the second winner of the Phil Jasner Lifetime Achievement Award by the Professional Basketball Writers Association. Monroe, who also covered the Denver Nuggets for the Denver Post, currently covers the Spurs for the Rivard Report. Monroe lives in San Antonio, Texas. Some franchises are synonymous with success. These rare teams combine sustained championship caliber performance, coaching consistency and reliable front office leadership. When these traits come together, a winning culture emerges and trophies line up on the shelves. Just ask the San Antonio Spurs. 100 Things Spurs Fans Should Know & Do Before They Die provides value for San Antonio basketball fans of all stripes. Loaded with facts, stats and anecdotes about the biggest moments and personalities in team history, this great new reference will entertain and enlighten even the most diehard fan. No Spurs supporter’s library is complete without it.